Kaylie and Liam sharing sweet moments while pretend-fishing at the lake. 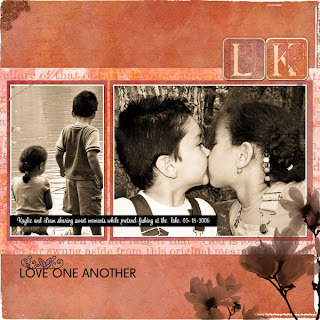 05-18-2006Font: Sweetheart ScriptInked edges: Scrap Edges 1 set at Cottage ArtsTemplate by Rachael Giallongo - SillyOne, DigichickPhoto corner and bg. paper from SWEET NOTHINGS paper pack at CottageArts. Short stitch, stamp blossom, title and alpha from SIMPLY LOVE page set at CottageArts.